All types of Epoxy and PU flooring for heavy duty industrial floors, Food & Pharma Floors and Decorative Floors for Residential and Hospitality Industries. 3 component epoxy self leveled monolithic flooring in desired shade or colour, it provides impermeable, smooth finish, highly durable and higiene floor. Available in 1mm, 2mm and 3mm. 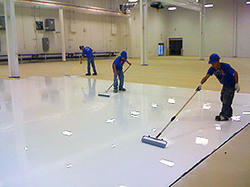 Looking for EPOXY FLOORINGS AND COATINGS ?